When diamonds come from the earth, they look nothing like the polished and cut gems you expect to see in fine jewellery. A lot of work goes in to turning these rough diamonds into perfect works of fiery brilliance. 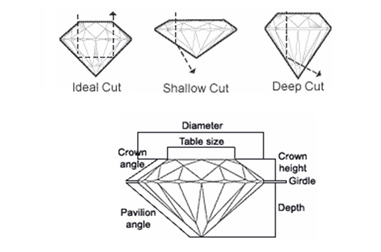 Cut and Shape are often confused – Shape refers to the outward appearance of the diamond (such as round, emerald, princess etc). Cut refers to the reflective qualities of the diamond. When a diamond is well cut, light enters through the table of the diamond, travels to the pavilion and reflects from one side to the other before reflecting back out of the diamond through the table. . This light creates a flashing effect that we know as brilliance/sparkle..
Cut is described with the following grades – Excellent, Very Good, Good, Fair and Poor. We’ve illustrated these cuts below to help visualise the grades. It requires a trained eye to judge the quality of a diamond cut, and our in-house diamond graders are highly qualified professionals who only select diamonds that they grade as ‘Very Good’ or better. Your diamond will be well cut, bright and sparkly, we guarantee it!